petition: Send 'Baby' the Circus Elephant to a Sanctuary! Send 'Baby' the Circus Elephant to a Sanctuary! A devastating Facebook video showing the emotional toll that life in a circus takes on animals has gone viral. Viewers can see a baby elephant in costume, backstage at Garden Bros Circus. The poor animal is facing a wall, sucking on its trunk for comfort, and has visible scars and suspicious marks all over its skin. Please sign this petition demanding that Garden Bros Circus send this adorable baby to an elephant sanctuary now! Life in a circus is horrific for animals. Instead of being able to explore, play and socialize with other animals like they are supposed to, they are forced to perform unnatural tricks onstage and are then confined in cramped spaces while off-duty. Animals in traveling circuses, like Garden Bros Circus, are forced to endure precarious circumstances and extreme temperatures for long periods of time while traveling from location to location. This video is a perfect example of how isolation and confinement wreak havoc on the mental state of circus animals. The abuse isn't just mental and emotional, though. Circus elephants are often severely abused. Trainers use bullhooks, ropes, and electric prods to beat elephants into submission and get them to perform tricks. It's clear from this video that some of these inhumane methods have been employed on the baby elephant. Times are changing, and people no longer want to see animals abused in circuses. 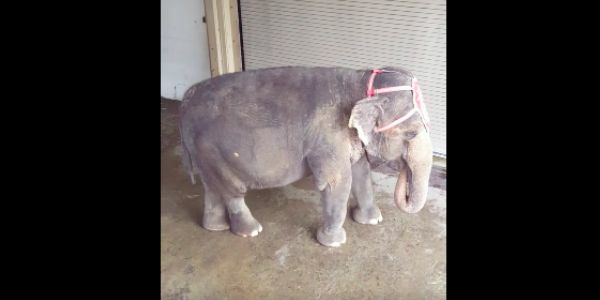 Sign now to demand that Garden Bros Circus release this baby elephant to a sanctuary immediately and commit to going animal-free in the future.